Last week, Amazon stunned critics by announcing a $15-per-hour pay floor for all employees and temps across its own facilities and those of its subsidiaries like Whole Foods Market. Excitement gave way to confusion among workers operating with scant details as to how these raises would impact hourly employees making close to or above $15. An internal email sent today by Whole Foods CEO John Mackey clarifies certain aspects of the pay changes—slated to go into effect November 1—and muddles others. For others, the gap between their pay and green recruits might be even slimmer, with one Team Member claiming their hourly rate after November 1 will clock in at a whole four cents above starting wage. Mackey’s email does little to square his own September 12 announcement of returning stock benefits for Whole Foods workers with Amazon’s announcement that those same grants would disappear under the new schema. 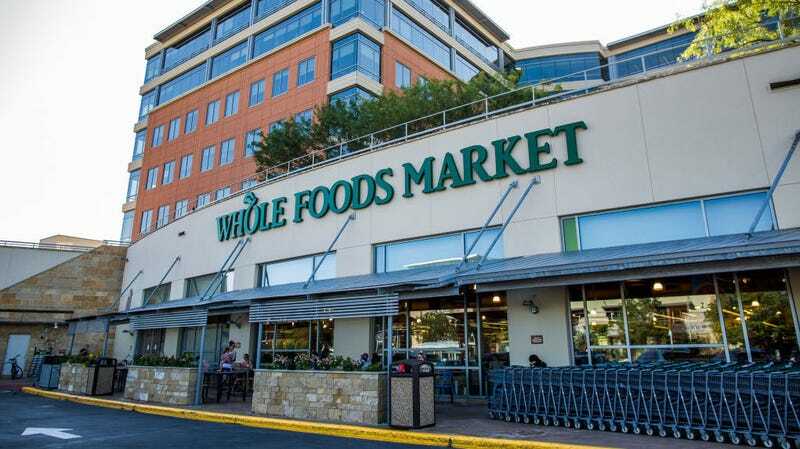 His email alludes to a “one-time grant” for Whole Foods employees with 6,000 or more hours of service, but it does not specify a vesting time or the number of shares offered. The announcement squares somewhat with information reported by Bloomberg on Amazon’s own pay increases, which appear to have increased from $1 to $1.25 for workers already at $15-per-hour, and will include periodic cash bonuses every five years of service that range from $1,500 to $3,000. To some degree, these changes may be meant to mitigate backlash from workers who believed, despite the wage floor increase, that their overall compensation would drop due to the company phasing out productivity incentive bonuses and stock options. We’ve reached out to Whole Foods and Amazon for clarification and will update if we hear back. Many of you are aware that our first year with Amazon was heavily focused on lowering prices, implementing Prime Benefits, and establishing Prime Now in 52 cities. These three programs have all been very successful in increasing our sales and we greatly appreciate the hard work of our Team Members as we continue to elevate the customer experience. As we close out the year and look to 2019, we’re committed to investing in Team Member Growth and Happiness and reenergizing the Team Member experience. This will include the Cultural Champions program and enhanced training and development opportunities that I discussed in the September 12 letter, as well as changes to compensation that will result in our hourly Team Members taking home more money in their paychecks. · The rate of pay for all full-time and part-time Team Members currently earning less than $14 per hour will be raised to $15 per hour. · All Team Members, other than Team Leaders, earning $14 per hour or more will receive a $1 per hour raise. · All Team Leaders in stores and facilities will receive an increase of $2 per hour. As we looked at total compensation, we evaluated our labor gainsharing program and realized that it no longer serves our Team Members as intended. Our projections indicate that with our current labor gainsharing model, very few team members would receive any financial benefits in 2019. Given the above, combined with the increases in hourly pay that were announced last week, labor gainsharing will be discontinued on November 18. All stores with labor deficits will have their deficits canceled at that time and Team Members will be paid out all remaining labor gainsharing surpluses in their December 8 paycheck. “Shared Fate” remains a priority for the company and by making a significant investment in higher hourly compensation, we are striving to create meaningful wage increases and higher consistent take-home pay for our Team Members. We commit that all our hourly Team Members will see an increase in total pay and promise to quickly fix any apparent exceptions. We’re also especially proud to continue our commitment to out full-time/part-time ration of 70%/30%, which we believe is the highest in the supermarket industry. Keeping with the commitment I communicated in my last letter, we will offer a one-time restricted stock unit (RSU) grant to all Team Members with over 6,000 service hours who have not yet received any RSUs. We will provide more details in the coming weeks. It’s important that your dedication and commitment are recognized, both financially and through growth and development opportunities. In addition to the investment in increased wage and the one-time RSU grant, we’re focused on additional investments that support Team Member Growth and Happiness including more tools, training and technology to make it easier for you to do your job and better serve our customers. A great example of this will be a new program that will recognize and appreciate our Team Members and stores who excel at delivering on our core value of satisfying and delighting our customers. This new program will being in 2019 and we will share more information in the coming months. Prior to our merger with Amazon, the short-term comps-driven pressure of the investment community limited the company’s ability to operate our business for the long-term good of all of our stakeholders. Amazon has freed us to think long-term once again, and it makes me very happy that with their vision and leadership we are able to improve pay for our Team Members going forward. While this investment will raise our costs, over the long-term it will increase Team Member happiness, make it easier to hire and retain talent, and improve our ability to serve customers. We know you will have more questions and we will be providing updates and detailed information in the coming weeks and months as we have it. Thank you for all you do for Whole Foods Market and for supporting our company’s purpose “To Nourish People and the Planet.” Whole Foods Market is only as good as our Team Members make us and we are so very fortunate to have such wonderful people working for our company.